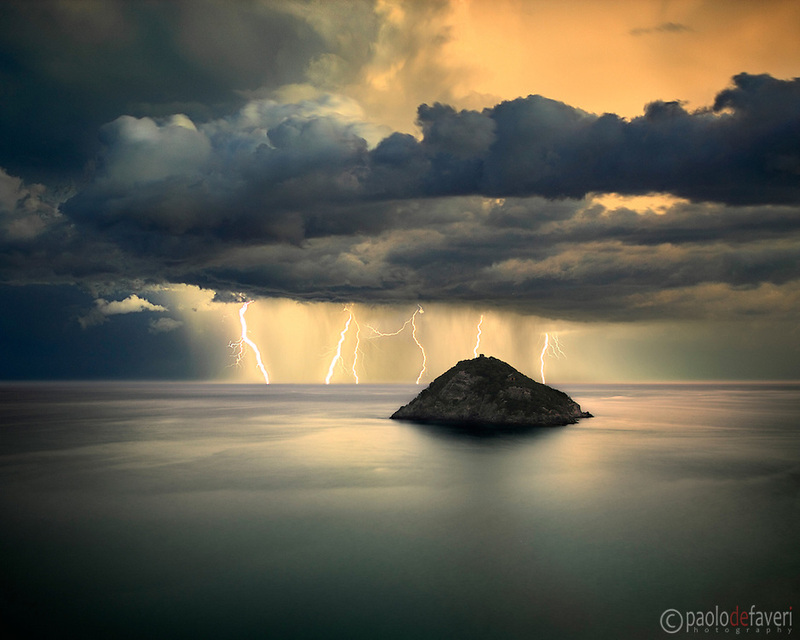 A mighty thunderstorm off the Ligurian coast near Bergeggi, Italy. This is a multiple exposure consisting of 5 shots of 15", each with at least a bolt in it. Taken from a vertical cliff about 100 meters above the sea level, on a evening of November, a few minutes after sunset. Notes about the technique: I initially took a single exposure of 90" of the same scene, with more or less the same number of lightning bolts in it. Unfortunately with 75" of exposure the clouds were badly blurred, and that's the reason why I opted for taking a number of faster exposures to be combined together. I noticed that the lightnings had quite a regular pace - more or less one every 10" - so I simply realized that by keeping the shutter open for 15", I would have easily recorded at least one bolt on each exposure. I did this for about 12 times, and then I chose the best 5 images to be stacked together. With this "trick", I've been able to produce an image with more or less the same number of bolts as the one exposed by 75", but with the clouds far less blurred. . This image copyright Paolo De Faveri 2009. .Any use of this photograph without the expressed written consent of the author is strictly prohibited by Italian and international copyright law. Violations will be prosecuted to the full extent of the law.